I stink at New Year’s resolutions. It’s true. I’m never able to keep them for very long at all. I try, but rarely do I manage to make it much past the middle of January. 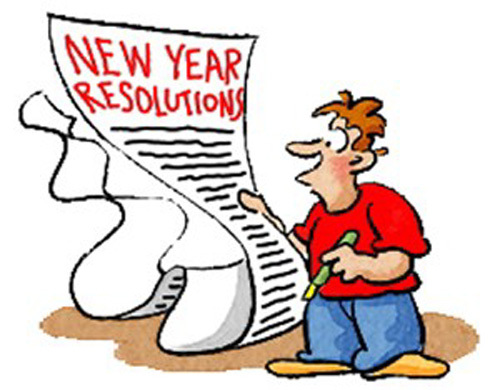 No matter how committed I am, it’s a given that by February 1st those well-intended resolutions are barely a thought in the back of my brain. I’ve always assumed my track-record with New Year’s resolutions is related to the fact that I am not good at sticking to routines and schedules either. It’s a fact that some of my biggest failings both as a mom and a school teacher are related to this character flaw of mine. But none of that seems to matter come New Year’s Day. Every year I find myself making half a dozen resolutions for the new year. Time and again, I have given myself permission not to make resolution. I make them anyway. It’s as if I am committed to failing more than I am to changing. Several years ago, I came across this idea of choosing a word for the year instead of making a long list of resolutions. I think the first year I tried this was the year my marriage fell apart. God very clearly spoke the word ENOUGH into my heart, and all year long I learned that He was enough and in Him I would have all I ever needed. But choosing a word didn’t stop my desire to make resolutions either. Just like buying fresh school supplies in August gives me a feeling of excitement over all the newness of a new school year, so the making of resolutions ignites a hope in me of all the good things the new year will bring. And isn’t that what God is about … giving us real HOPE for the future? I love that about God. It makes me all tingly to think about getting a clean slate. Through Him (and Him alone) we find hope that we can change and become a better person. His mercy flows to us, the past mistakes and bad old habits are gone with the past, and a fresh start is given. This is why year after year, I try again. I resolve to do better, to become new and fresh in my personal life, just as the start of the new year offers me a fresh place to begin again. Thankfully, my God is a God of fresh starts. He loves to extend His mercy, and is rich in giving second chances (and third and fourth and fifth ones too). If that doesn’t make you feel all giddy for 2015, then I don’t know what will! Just think … It’s a fresh year, a brand-new hope, another year to anticipate all the good things we will experience over the next 12 months! And the best part is … even on the bad days, even when our resolutions fail, even when it seems that all hope is gone … even then, we can trust in God to give us a fresh start, to offer a new chance, to extend to us a place of rest and mercy until our weary souls are able to get up and try again. That said, I’m still making resolutions for 2015. After all, I’ve got hope that even at the ripe old age of 42, I can still change and learn a few new tricks during this brand-new year. 1. Read the Bible daily, working toward reading the Bible in its entirety. I am using Bible Gateway to help me accomplish this. I chose one of their Bible reading plans, and it will be delivered to my email inbox daily. I’ve never tried this in the past, always preferring to use a devotional that I could hold in my hands. However, now that I mother seven kids, it no longer works for me to spread out on my bed with devotional book and Bible. I’m stretched for time and energy. Jon has been doing his Bible reading via email for at least two years. He is able to keep up with his Bible reading because the reminder to do it is there every time he checks his email. Once again, I’m inspired by my husband, who truly is the spiritual leader of our home. 2. Memorize two Bible verses per month. Each year, Beth Moore encourages women to join together to memorize 24 Bible verses during the year. I’ve tried this before and didn’t succeed … but I did 8-10 memorize verses, which is more than I would have learned otherwise. I’m going to give it another shot this year. Who knows … maybe I will get through the entire 24, but even if I don’t, I will surely end 2015 with more of God’s word hidden in my heart than if I didn’t try at all. If you are interested in committing God’s word to memory, perhaps joining the Siesta Scripture Memory Team would be the very place to start for you as well. 3. Write 500 words per day through January. I’m joining Jeff Goins and his team, and accepting the challenging to write 500 words every day for 31 days. Writing that counts includes blogging, working on my book, and free writing. What does not count is emails, or writing with my children as part of their schooling. Later in the year, I hope to complete other writing challenges, such as the A-to-Z Blog Challenge and a couple more Blogger U courses. But for now, focusing to write just 500 words a day is the place where I’m going to start. If you are a blogger or someone who likes to write, perhaps this writing 500 word challenge is for you as well. 4. Pick up where I left off last summer with healthier eating habits. Last year, Jon and I started following The Daniel Plan (by Rick Warren), and we experienced a lot of positive health benefits, including some weight loss. Not only was the food delicious, but we felt so much better. However, over the summer, we experienced a time of financial strain due to some unexpected expenses. We pulled back from purchasing some of the more expensive healthier foods, planning to return to our new eating habits in a month or two. Yet, with the addition of two foster babies and the sudden death of my father, eating healthy became the last thing on my mind. Suddenly I was right back to my old habits, which aren’t terrible as I rarely use processed foods or feed my family fast food, but definitely not the best I can do either. Jon and I are looking forward to restarting The Daniel Plan this coming week, and once again experiencing the benefits from living a more healthy lifestyle. Finally, I’m doing what I always do … adding a word for the year to inspire me on the days when I need encouragement to move forward in sticking to those resolutions I’ve made. In another month, the newness of today and this brand-new year will be worn off. My life will once again feel as mundane and boring as it did yesterday. I’ll feel weary of trying to make a new start. Yet there will still be hope springing forth, spurring me on as I continue to try … for the joy of Christ comes in learning to give myself completely to Him and in doing so I find I am living smack in the middle of His mercies, which are fresh and new every morning, even when I don’t feel that way myself. Wishing you and yours all of God’s best blessings and mercies in 2015! Some beautiful goals, and a wonderful reminder that we serve a God of fresh starts! Best of luck to you, and may your 2015 be truly blessed! Last night Jon and I talked over our anniversary dinner and I told him that 2014 had many wonderful memories and God-ordained moments … and yet it was one of the saddest years I’ve ever known as well. (At least these last 3 months have been filled with grief.) Anyway, I’m eager to welcome 2015 and see what God will bring to us in the coming year. Blessings to your family, too! I really am sorry that you’ve all had to go through this these past three months…we’ll be praying for you all as you head into a new year, full of exciting possibilities! I love this. I stopped making resolutions many years ago but I love the idea of seeking through spirit a word that would direct our lives. Thank you so much. Delightful honesty. NEW! Such a blessing. And in this new year I stopped and prayed for you and your sweet hubby Jon. May you each spur each other on to follow the God who IS. Thank you for those prayers! I don’t know anyone who can’t use a few extra prayers on their behalf. I’m definitely looking forward to experiencing more of Christ in me in 2015. A word instead of resolutions is such a good idea!! I didn’t make any New Year Resolutions because I hate the depressed feeling I get when I break them…several weeks in a row. Since I will pick a word, it will be ‘patience’. 😉 I will pray for you and your resolutions!! I’ll pray for you too … to be able to practice patience. Definitely something I could use as well. BTW, there is a website called My One Word where people talk about this idea of just having a word each year instead of a resolution. Really?? I’m definitely going to have to look that up! !